“Is strawberry made of straw, if not why is it called so? Was the Jack fruit discovered by Jack, if not why is it known by that name? Are grapes gray in colour, if not why are they called grapes?” I was interrogating Amma by taking out the fruits, one by one from our fridge. She was both amused and confused. After a few seconds she came to me and said with total seriousness – “I don’t know about the rest, but orange is orange in colour and that’s why it’s called so” — She burst out laughing and handed me an orange. Unlike the other fruits we never brought oranges from outside. We grow an orange tree in the middle of our back yard. It was planted by my Ammai. Some oranges are sour while most others are sweet. Orange is Amma’s all time favourite fruit. Apparently, after their marriage, Appa used to take Amma to this orange tree and they sat there for hours. Amma used to love oranges and Appa enjoyed watching her eat them. For her the oranges and that orange tree is a sign of the love that they shared. At home, before their skin turned from green to orange we pluck and store them in a huge basket. It has a strong smell. Every time one eats an orange, the others get to know about it as the smell spreads all over the place very quickly. It is amusing that every part of the orange is useful in some way or the other. I like the fruit but I like the skin more. For me, the orange peel is a tool for fun. As a child, I loved squeezing it into my sister’s eyes and running away, while she tried to catch me. It gradually became a habit that whenever I got an orange, I squeezed its skin into the eyes of the person sitting next to me. Luckily, only my roommates have had to tolerate this. I was a girl who liked anything and everything bright. I used to go and hug teachers who wore bright and beautiful saris. When friends brought chocolates in school, I picked up the ones with the brightest wrapper, as I believed that the brighter it looked, the tastier they would be. I don’t know whether it is the love towards the bright colours that attracted me to this fruit or if the liking towards orange fruit that made me to like the bright colours. For me, orange is a special fruit not because of its smell or taste but because every time I think about that fruit, I could imagine the story shared by my amma, if for her, orange is a sign of love, for me orange is my childishness. 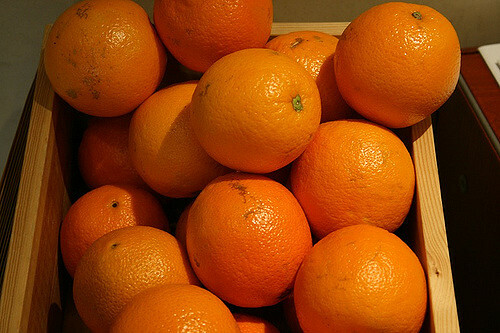 I believe that there is a sense of truth in that fruit, after all “orange is orange in colour”.